Our Nature Spa is located in a private bure setting surrounded with natural jungle and a rock waterfall. The ocean, a stones throw away complements the soothing and relaxing sounds of the tropics. Let yourself be swept away whilst an exotic blend of oils, mixed with coconut milk & honey are massaged into your body, leaving you feeling light and tension-free. 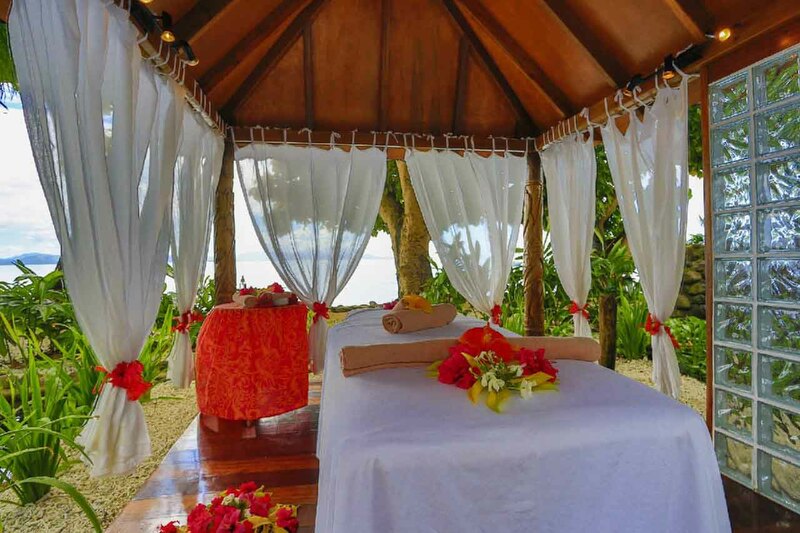 Harnessing traditional Fijian techniques, this massage employs the richness of coconut oil to ease away stress from top to toe, ensuring complete bliss for your whole mind and body. Relax whilst your spa therapist soothingly applies a nourishing brown sugar recipe infused with frangipani oil to your entire body, making you smell and feel incredibly sweet. This tropical treatment uses freshly grated coconut to exfoliate away any dry and tired skin. This is followed by a moisturising full body banana leaf wrap, allowing you to reveal a fresh and silky smooth body. The natural goodness of pure Fiji ingredients leaves your skin soft and radiant. Includes a relaxing massage to ease tired necks and shoulders. Let your hands be taken care of in paradise. Includes a refreshing hand massage using coconut oil. Keep your toes looking great under the sun. Includes a relaxing foot massage using coconut oil.